At the start of the novel Amal Mohsamed Nasrullal Abdel-Hakim is beginning a new year at school. She makes the decision to wear the hajib (veil), a choice which shocks the staunchly traditional McCleans Grammar School ‘ with ‘more than one hundred years of proud history’ ‘, shakes her friends and concerns her parents. An interesting balance between being assimilated into Australian society and retaining one’s religious and cultural convictions is found by Amal. Enviably, this breaks down some of the stereotypical views of Islam that have been promulgated in the wake of terror’ It also provides a fresh outlook on what in essence are fairly mainstream topics in teenage literature. Amal finds romantic interest in studious, sensitive Adam, this is tempered towards close friendship, conflicts arise resulting from parental influence and there are preoccupations with image and weight. As a construct, the hajib is a particularly pertinent one in this respect, the intentions of adorning it are to help focus on internal beauty rather than its external manifestations ‘ in a world where the media have constantly manipulated acceptable body imagery this comes as a refreshing change. It is the courage of her convictions that make Amal such a strong and endearing protagonist and it is through her discussions with teachers, friends and family that she is able to arrive at and embrace her ‘identity’, however, wide or narrow that might be perceived as being by her compatriots. The red kite in ‘Granny Sarah and the last red kite’ evokes far more than mere ornithological interest. Vested within it is the sense of special accord Lowri feels for the stories from her Granny Sarah’s past, for her Granny Sarah’s house and its surroundings and ultimately of course for her Granny Sarah too! The story charts the history of the red kite in Britain beginning with the legendary veneration of the birds by the King of England who praised their ability to keep clean the streets of London but moving through to the disparagement they suffered at the hands of farmers and game-keepers who believed them responsible for the death of too much poultry and their eventual extermination in both England and Scotland. Moving into Granny Sarah’s own past, the story tells of the last mating pair of red kites in Wales who nested in an old oak tree at the bottom of her childhood farm. The pair are threatened as a child endeavours to earn a little money from an egg-collector by raiding the nest. Quick thinking and determination on the part of Granny Sarah are able to save the brood, however and the young are reared successfully, securing the fate of the red kite in Wales. A fact sheet about the red kite is included within the book providing facts about the birds, where they might be sighted and directing readers to sites for further information. Childhood nostalgia and Malacy Doyle’s awareness of the importance of stories combine to make this a particularly heart-warming book. The story is empowering in that it stimulates recognition that as part of a community we can all play a role in conserving the diversity of our countryside and the heritage of our land. The red kite itself is a perfect and inspiringly powerful motif to capture this and Petra Brown’s soaring illustrations fully realise this. Split between two narrative voices, those of Bella and Danny, ‘The Ex-Files’ uncovers the feelings of rejection and loss following the end of a relationship and brilliantly charts the onset of changed behaviour and attitude that often follow. Balance is achieved between normalising these feelings ‘ depicting the way people tend to be afflicted ‘ whilst sensitively maintaining the individuality of both cases. ‘The Ex-Files’ themselves are a secret organisation led by the enigmatic Rupert and Juliette from the seemingly unlikely though remarkably homely environs of ‘The Copper Kettle’, a local tea-room serving fresh-baked scones. Keenly aware of the mentality of the ‘dumpee’ and of the power wielded over them by the ‘dumper’, Rupert and Juliette have established a professionally run organisation offering advice and a twenty-four-hour listening service. Sibling jibes, rivalry and jackanapes form the background to Chris Powling’s book ‘On the Ghost Trail’ which forms a part of the ‘Mystery and Adventure Stories’ collection for year three pupils in A & C Black’s ‘White Wolves’ range for guided reading. An accompanying resource guide can be bought to support use in class. This series has been developed in conjunction with the Centre for Literacy in Primary Education. Adam plants the seed of doubt in his younger brother and sister’s minds (Ben and Susie respectively) when he suggests that the cobwebs in the fireplace are actually trails left behind by ghosts, or that the twig tap-tap-tapping on the window pane is in fact a ghost’s heart beat. So begins a midnight mission, a dare amongst the two brothers that they should visit a nearby graveyard. Whilst there, however, a flash of intense light startles them and they immediately run for safety’ Is the light a supernatural apparition or is there a more surprising ending still?! A fun book that explores the nature of bravery. A father figure is absent for Luke in ‘Taking Flight’ by Julia Green. It is easy to empathise therefore with the sense of closeness existing between Luke and his grandfather, who appears to constitute the boy’s sole paternal influence. His grandfather’s house and its gardens represent a safe-haven for him, an area in which Luke’s imagination is unshackled, a clear opposition to the rigour and rules implied in his school life. The sense of freedom and the ability Luke has to be a child: to explore, to discover, to play and to imagine, relieve him of responsibility. This carefree existence is shattered by the impending sense of reality that is unwittingly imposed through the concerns of Luke’s mother. ‘In the car, she tells Luke that he ought to help Grandad in the house more. ‘Didn’t you see the piles if dirty dishes in the sink?” This tension between the responsibilities of adulthood and the carefree time of childhood is never resolved and highlights the ways in which children in single parent families sometimes appropriate adult anxieties. Nonetheless, grandfather’s condition is deteriorating and he is eventually admitted to hospital. Luke makes him a promise that he will look after his pigeons, but soon after realises that his unlikely to recover. The ending to the novel is at once poignant, moving and uplifting as the pigeons fly-off into the sky and Luke and his mother move into the home where he has memories of enjoying his childhood. 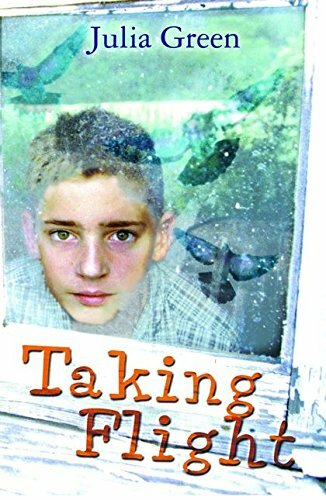 ‘Taking Flight’ forms one of the novels in A & C Black’ guided reading series ‘White Wolves’, this novel is a part of the ‘Stories that raise issues’ collection for year four pupils and there is a teacher’s resource pack that can be bought alongside it to facilitate use in the classroom. The book, however, is a perfectly satisfactory read in its own right too. 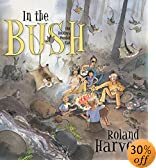 The hustle, bustle and jostling of family life are perfectly presented in Roland Harvey’s ‘In the Bush’. The narrative voices of five family members are successfully interwoven in this picture books, giving a meticulous multi-dimensional account of a family camping holiday with dad’s insistent needs concerning the campsite, Uncle Kevin’s dare devil deeds and Frankie’s exuberance about pretty much everything. Each double-page spread features a large illustration ‘ the type with such minute detail that means they can be pored over for hours by those with eager eyes! The illustrations bleed into a white footer within which the narrative is told utilising a mixture of text and snapshot illustration providing vignettesin a hybridisation of the picture book and graphic novel forms. Maps included within the footer section make it possible to chart the family’s journeys and adventuring and give an ‘as it happens’ feel. A big thank you also to Allen and Unwin for detailing the illustration techniques used within the book ‘ in this case dip pen and watercolour ‘ if only all publishers would follow suite. This is a picture book with a fresh and funny style. I’ve always secretly believed that my pets could understand everything I said, and that it was my own ignorance of their language which made meaningful communication a problem. It seems Gabrielle Zevin has a similar inkling, since her latest book (just published in paperback) opens with a moving account of a dog’s reaction to her teenage owner’s death, and its frustration at not being understood by the remaining members of the family. My heart was immediately won over by this touching prologue, which sets the tone for what becomes a magical, philosophical and tender interpretation of the Afterlife. Following the post-death journey of a teenage girl, Liz, who is killed in a hit-and-run accident, Elsewhere’s title refers to a kind of alternative heaven in which people age backwards and eventually start all over again, coming back to Earth as babies. On arriving in Elsewhere, Liz goes through the inevitable stages of denial, bitterness and desperation before coming to accept her new (non)life. She finds her niche as a dog warden (people in Elsewhere have ‘Avocations’ rather than jobs) and discovers she has a natural gift for speaking canine. A far cry from other prescriptive and clich’d (and often religiously weighted) metaphorical novels on death, Zevin has created an inspiring fantasy that encourages light-hearted contemplation on what would normally be a gloomy subject. Her airy, fluent prose conjures a dream-like, expectant atmosphere, and her engaging characters literally bring death to life. Elsewhere has all the ingredients of a classic teenage rites-of-passage, but with an elegant, original twist that sets it apart from the rest. 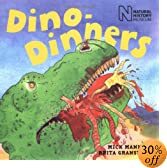 If you’re struggling to tell the difference between an Oviraptor and a Velociraptor, or knowing your Tyrannosaurus from your Brachiosaurus, ‘Dino-Dinners’ is the book for you. Published by Frances Lincoln in conjunction with the National History Museum, ‘Dino-Dinners’ ties in with the opening of the museum’s new family exhibition ‘Dino Jaws’. Granstr’m and Manning have joined forces here to outline the dietary delectations of numerous dinosaurs. These are told in verses alongside illustrations of the giant lizards dining. Each dinosaur entry is supplemented by a black-and-white illustrated fact box, providing pronunciation details for their names, the time period in which they lived, their size and other facts. This is a great first book about dinosaurs and one that will have you coming back to find out more time after time. What constitutes our memories and impressions of a place? Whatever else may play a part, the role of the senses is key, perhaps a sound, a scent, taste, a sight or a particular feeling might evoke an instant picture of a place so potent as to make one pause for thought, lost amidst the concentration of contemplation. ‘J is for Jamaica’ is the most recent book which, like its predecessors, features vivacious language and vivid pictures. Performance poet, Benjamin Zephaniah, has written the text here and it positively oozes with his enthusiasm for the juicy joys of Jamaica leading through a description of the savoury and sweet Ackee fruit, up the rainbow-strewn Blue Mountain, along the waterfalls and beaches, into the heart of the market and home safe beneath the protection of a zinc roof. As part of the key stage two geography curriculum, many children will study the Caribbean, focusing particularly on St. Lucia , ‘J is for Jamaica’ can’t fail to augment their learning and to bring to life the one love of Jamaica. 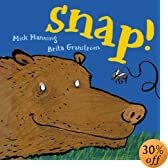 Guzzle, gobble, snap, snap, ate, caught, snap, snap, swallow’ There’s a wonderful style and warmth of expression in Mick Manning and Brita Granstr’m’s latest collaboration, ‘Snap!’. Starting with the imperative, ‘Look!’ it presents readers with an x-ray-specs-view of the food-chain in masticatory-motion! End papers are a remarkably reminiscent abstract of collage material evoking grasslands, the horizon and the wide expanse of sky. This rich and multi-layered technique of collage forms the backdrop for each of the pages with coloured pencil and ink being used to overlay additional fine detail. The resultant illustrations effervesce with all the energy and humorous expression familiar to followers of Granstr’m and Manning’s work. The text brims with playful good humour and chuckles along delighting in the variety and range of the English language, establishing a rhythmic pace that makes this an ideal book for reading aloud and for performance.